Special Containment Procedures: SCP-3407 is to be kept facing a 5x13 m projector screen and is required to be kept inside its projector booth at an elevation of 8 meters. Lead researcher Dr. Carter, lip reading specialist Researcher Lynn, and two designated Level-1 Personnel are to be present at Site-28 by 12:30 PM (local time) to annotate SCP-3407’s daily projections. 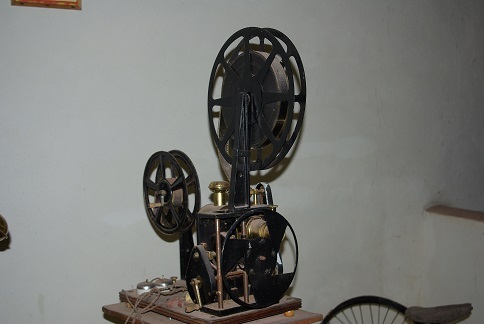 Description: SCP-3407 is a Pathé-Frères 1910 model film projector. It displays signs of wear consistent with its age and is structurally identical to non-anomalous instances of the product. At precisely 1PM local time every day excluding Sunday, SCP-3407 will project a black and white silent film. The setting of the film is in the suburban town of [REDACTED], portraying the first-person point of view of an adult African-American male. The film will play for approximately twenty-five minutes each showing before becoming inoperable again. SCP-3407 will always project its own film whether or not a reel is placed within its feed spool, though it has been shown to produce lower quality projections when a reel is within SCP-3407. SCP-3407 has also exhibited the ability to activate without any form of electricity or manual operation. Attempts to activate SCP-3407 outside of its scheduled projection have all been met with failure. Upon each projection, SCP-3407 will display a sequence of events distinct from prior showings of the film. A common trend in SCP-3407’s projections is the aforementioned male interacting with a juvenile female, presumed to be the subject’s daughter. Scenes involving the female usually take places in areas such as playgrounds, churches, and a small bedroom. The final five minutes of the film always conclude with the subject being forcibly restrained against a bed before another figure, presumed to be a doctor, approaches and injects the subject with an unknown substance. Individuals exposed to projections of SCP-3407 report an altered emotional state. Instances of sorrow, nostalgia, and mild euphoria have all been documented. No harmful effects have yet been observed after viewing a projection from SCP-3407. Addendum 3407.1: Dr. Carter has been designated as the primary researcher of SCP-3407's anomalous abilities. The following is a truncated list of projections documented during observation of SCP-3407. 00:00 - Scene appears to be in a wedding chapel. Camera POV is shown to turn around to see the subject’s friends and family in the seats of the chapel. 07:13 - Camera shifts towards the entrance of the chapel. A noticeably pregnant African-American woman is shown walking down the aisle with an adult male, presumed to be the woman’s father. 12:35 - Camera is facing the woman. The woman is observed to be both smiling and lightly weeping at the same time. After 5 minutes pass, the wedding officiant is seen to state what is inferred to be “I now pronounce you husband and wife. You may now kiss the bride.” The camera moves forward and the male begins embracing the woman. 18:45 - The subject and woman hold each other's hands and begin walking down the aisle. Friends and family stand up from their seats, applauding the newly wedded couple. Screen unexpectedly shifts to black. 20:00 - Screen luminates after 75 seconds of dead air. Subject begins to observe their surroundings and finds themselves restrained against a bed. Subject begins thrashing in an attempt to free themselves. An unknown figure enters the room, presumed to be a doctor based on their attire. The doctor stands at a counter near the subject and begins filling a syringe with an unknown substance. Subject continues thrashing in the bed as the doctor injects the subject, causing the screen to instantaneously turn black. 24:30 - Film unexpectedly burns out. Projection continues for another 30 seconds before becoming inoperable. 00:25 - After 25 seconds of film tearing, SCP-3704 readjusts itself and begins the projection. The camera is moving forward up a hill. The subject is accompanied by a small, juvenile African American female, estimated to be close to 0.64 meters; presumed to be the subject’s daughter. The subject is shown to be holding a bouquet of roses and tulips. 04:36 - The subject and the female reach the peak of the hill to find a wooden cross in the ground. Inscribed on the cross is what is presumed to be the name of the deceased: “LORETTA”. What appears to be water droplets begin flowing down the camera on both the left and right sides. The subject places the flower bouquet on the cross. 15:03 - Subject and the child take each other’s hands and begin leaving the hill. 16:00 - Film burns out, leaving the projection inoperable for nearly 4 minutes before reactivating. 20:00 - Projection becomes active again, displaying a similar scene from the former projections. The subject observes their surroundings and begins thrashing more forcibly than previous projections. The same doctor seen before enters the room, presumably shouting at the subject to be quiet. Subject refuses to comply, to which the doctor approaches the subject and injects them with a syringe. 23:30 - Screen blacks out. SCP-3407 remains active for another minute and a half before becoming inoperable. 00:00 - Scene begins in the middle of the night within a master bedroom. Camera suddenly begins shaking when the subject hastily jumps out of bed. Subject sprints out of the room towards a separate, smaller bedroom. 02:05 - The juvenile female is shown lying in her bed in a state of distress; tears and mucus are seen flowing down her face. Subject takes a seat on the bed and begins comforting the female. 10:00 - The former scene continues until the female eventually returns to a tranquil state. The subject opens the drawer to a nearby bedside table and pulls out a bright feminine hairbrush. There is a small lily1 flower engraved on the end of the handle. Subject begins to use the hairbrush to fix the female’s disorderly hair. 14:35 - Subject brings the female to a nearby vanity mirror, where the female observes her brushed hair. The female smiles and moves her mouth in a way that has been identified as “I love you Daddy”. The female, while smiling, puts her arms around the subject; the subject does the same while slowly caressing the back of the female’s head. 18:43 - Screen changes to black. 20:00 - Projection becomes active once again. Scene reflects the same chain of events as previous entries. 24:25 - Projection burns out, leaving nearly half of a minute of dead air before SCP-3407 becomes inoperable. 00:00 - Scene begins with the subject and the female bonding with each other as they walk down a street. The female is seen laughing as the subject lifts her on his shoulders. Several shots display a pair of feet dangling down as the subject begins sprinting down the road. 04:02 - Subject halts as the two come across a small playground, complete with a double swing set and a slide. The female gestures the subject to take her to the playground; subject complies. 06:08 - The female jumps up on one of the swings. Lip reading specialist Researcher Lynn finds that the female says the words: “Daddy, can you please push me on the swings?” Subject complies, adding momentum to the female while swinging. 09:37 - Female jumps off the swing set and runs over to the slide. Female gestures the subject to push her down the slides, the subject once again complies. 13:03 - Female is shown to be in a mix between exhaustion and euphoria. The subject lifts the female up into his arms and carries her to a nearby bench. The two sit on the bench together, pointing out any birds that fly past in the sky. 20:00 - Scene suddenly cuts from the playground to the ending scene from previous entries. This time, however, the doctor does not appear. Water droplets begin flowing down the left and right sides of the screen. 24:30 - Film burns out. Projection continues for another 30 seconds before becoming inoperable. 00:00 - Scene begins in a church. The subject is sitting in one of the upper right front rows sitting next to the female. 03:31 - Subject opens a nearby Bible to Psalm 23:42. People nearby do the same. 09:44 - Priest walks up to the podium and gives the benediction, ending the service. Subject and the female rise and begin to exit the church. 11:21 - The subject and female spend the rest of the scene walking through a neighborhood together. 20:00 - Scene cuts to the same setting as previous projections. The doctor is seen sitting at the foot of the bed the subject is restrained upon. The doctor begins what is presumed to be stroking the side of the subject’s face, forcing a smile while doing so. 23:28 - Subject bites the doctor’s right index finger. The doctor’s blood begins gushing over the bed sheets as the subject bites harder. 23:56 - Subject releases the doctor's hand. The doctor is seen in an intense state of distress, holding their hand as blood gushes down. The doctor regains their composure and begins filling the usual syringe to a much higher amount than seen in previous projections. Subject begins thrashing in their bed until the doctor injects the subject with the substance. 00:00 - Scene begins with the subject and female walking on the side of the road. For a few frames, the female is seen smiling at the subject as she reaches to hold his hand. 05:01 - The scene is now in what is now found to be the 1910 version of the town’s main street plaza. The subject and female begin to walk down the street as a group of Caucasian men give the subject unpleasant glances when passing. 07:06 - Camera pans up to a building with the words “NICKELODEON ¢10”. A poster is seen at the entrance stating: The EDISON KINETOGRAM - Scene from ‘Frankenstein’. To the left of the poster, there is a sign in bolded, capital letters that reads: “WHITES ONLY.” The female points to the Frankenstein poster, asking the subject if they can see the program. The subject presumably denies the request. Female grows visibly upset by this and enters the front entrance of the Nickelodeon. The subject enters in after her. 10:04 - Subject instantly rushes after her only to be stopped by a crowd of caucasian males. The men apprehend the subject, squirming and fighting to be released. The female is briefly seen in several shots, appearing to be in a state of distress while being apprehended by security officers. 13:05 - The men carry the subject to an upstairs closet of the Nickelodeon. 15:00 - Film begins tearing. 20:00 - SCP-3407 finally readjusts itself; the projection continues. The scene reflects the chain of events typically projected during the final five minutes of previous projections. Noticeably, there are two dark silhouettes seen conversing in a door frame. 02:02 - Projection begins after two minutes of film tear. The camera is pitch black; nothing appears on the screen. 05:29 - Screen suddenly luminates. What is briefly seen to be a burlap sack is lifted off of the subject’s head, causing the screen to no longer be pitch black and reveal the scene. A tall Caucasian male in surgeon attire stands before the subject. In the background, three silhouettes are seen writing on clipboards. 06:07 - The surgeon holds a scalpel and moves the blade of it near the left side of the camera, presumably toward the subject's left eye. 09:08 - The film burns out after several brief frames are seen of the subject thrashing due to a considerable amount of pain. 12:00 - Screen suddenly displays a dialogue frame commonly seen in silent films to convey character speech. The screen says in bold cursive writing: “Where is Lily?” Frame continues until the end of the projection.